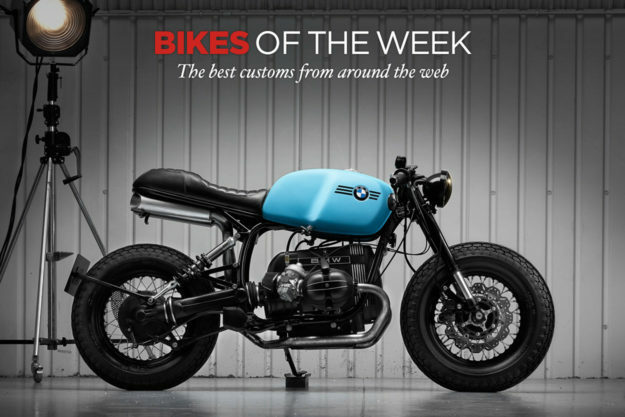 A baby blue BMW R100, a brilliant orange Ducati 900SS, and a murdered-out Harley Street scrambler. It’s all about the color this week. Ducati 900SS by CC Racing Garage World Ducati Week is a three-day celebration of Bologna’s absolute best, and Ducati’s way of giving thanks back to fans. Three days will always be four short of a week, but there is no shortage of custom Ducs making the pilgrimage to Misano. BMW R100 by Sinroja Motorcycles Turning your back on a salaried position to open a custom bike shop is the stuff of both dreams and nightmares. It takes talent, charisma and an irrepressible work ethic—exactly the traits we’re seeing from brothers Rahul and Birju Sinroja of Leicester, England. 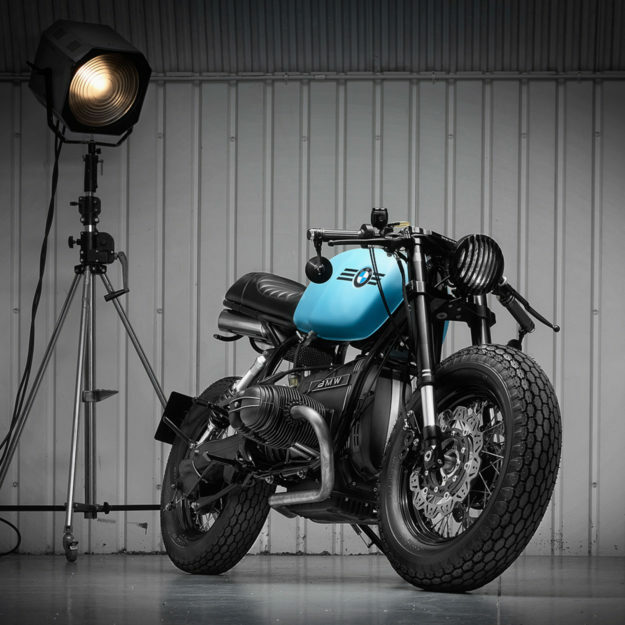 Working closely with their client, Sinroja Motorcycles were asked to deliver a BMW airhead in the brat café style, rolling on Down & Out-sized rubber. The R3 Racer not only ticks those boxes—it hammers out a few others as well. The stance defies convention with its tail in the air—but the aggressivity is refreshing, helped by the Yamaha R1 front forks fitted to custom yokes. To make sure it delivers on its intentions, the R100 boxer engine has been completely rebuilt to ‘zero hours’ status. And its finish is second to none—the cases were aqua blasted before repainting. Kawasaki Ninja 650 by Smoked Garage The Ninja isn’t exactly the first bike that comes to mind when musing about donors for a cafe racer build. We tend to focus on bikes with a more classic aesthetic, not those built to appeal to the racers-in-training. But surprises like this are exactly why the custom world is so mesmerizing, especially when we look to Indonesia. 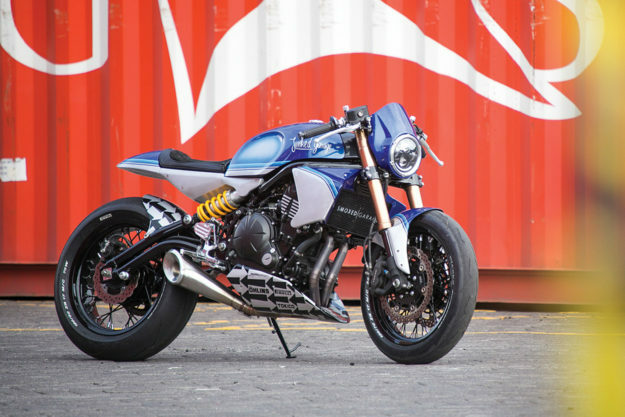 This isn’t the first time Bali’s Smoked Garage has turned the tiny Ninja into a masterpiece. Their Bronco would have you questioning the logic behind the $190,000 auction bid on a Lotus C-01. And their latest Ninja, the ‘Sublime’ we see here, is yet another stunner. Every mold-injected piece was quickly removed in favor of hand-formed aluminum bodywork. The drawing board originally called for a single-piece seat and tail unit, but the idea was scrapped due to sizing issues—and an intricate three-piece unit was fitted instead. The rad covers and belly pan add visible ballast to the front end, but I don’t think the bike suffers for it. Harley-Davidson Street 750 by Little Horse Cycles Whether it’s ‘lifestyle’ or riding style, there’s no denying the appeal of scrambled rides at the moment. Most recently, Yamaha scored some impressive points with their well-thought out SCR950. But we reckon this scrambled Harley Street 750 would give it a run for its Red Wings. Built by the capable hands at Portland’s Little Horse Cycles, this is more than a simple knobby-swap. 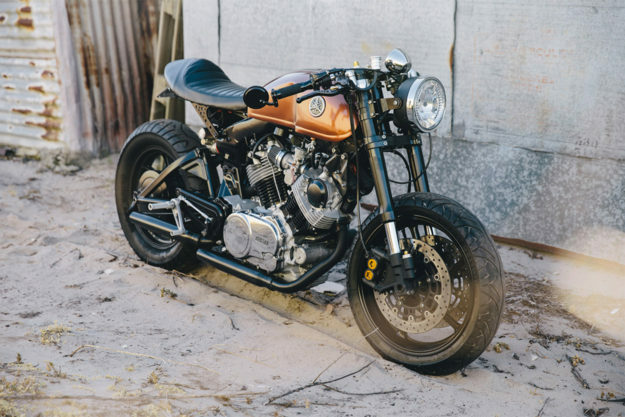 In fact, the wheels themselves used to call a KZ650 home, which helped Andrew Cornellison and his team by moving away from the Harley Street’s tiny 16-inch rear—and set things up for a chain drive conversion. To make that work, the search was on for a front sprocket that would play nice with all parts. 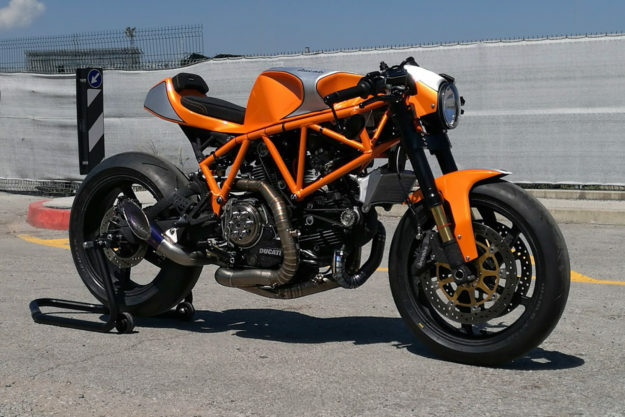 Surprisingly, it was found and poached from a Ducati Multistrada. Yamaha XV1000 by Sol Invictus Motorcycle Co. Greg Hageman is the authority on turning Virago cruisers into rolling works of art. If you’ve got an XV yearning to be made over, turn to Greg for inspiration. That’s exactly what Adriano, the Australian owner of this 1982 XV1000, did. 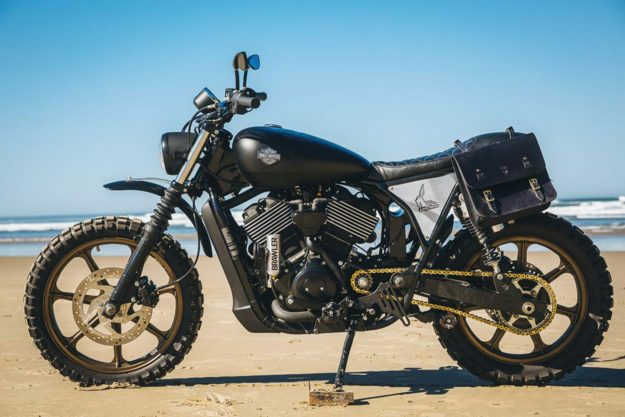 With help from Sol Invictus Motorcycle Co., he’s turned his 1982 monoshock XV into a classy vintage-style café racer. Even the smallest nuts, bolts and washers were stripped down to bare metal, and the frame was sandblasted and powdercoated. The tank is from a 1965 Benelli and fits the build profile perfectly. Upgrades to suspension come in the form of Yamaha R6 components at both front and rear, which turn this cruiser into a bona fide carver.